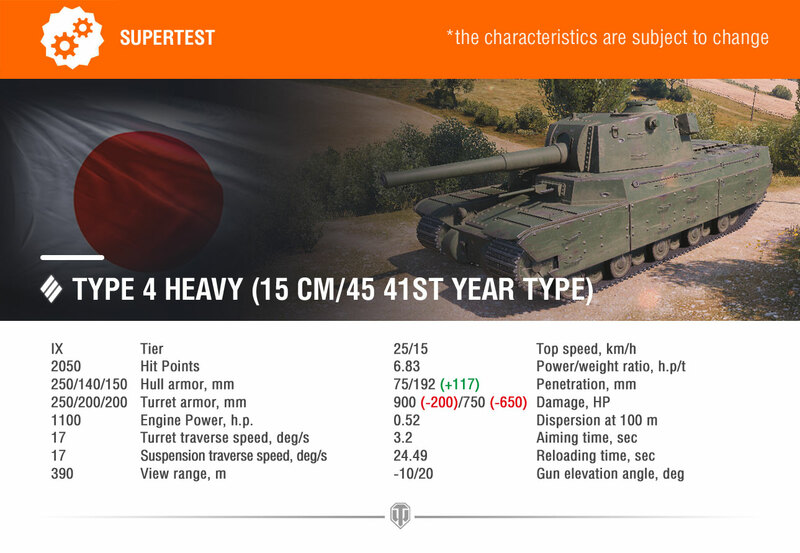 Both Japanese heavies will have the stats of their top guns (14-cm and 15-cm) tweaked. The former’s rounds will increase in armour penetration (from 249 mm to 252 mm for the standard shell and from 282 mm to 290 mm for the special shell). The changes to the 15-cm cannon “HE gun” will be more severe. The damage of its basic HE round will decrease from 1,100 to 900 points, and the special round will change from HE to HESH, with armour penetration increasing to 192 mm and damage decreasing from 1,400 to 750 points. Besides all that, the top Japanese heavy will become more mobile, gaining 4 km/h in top forward speed, 3 km/h in top reverse speed, and 3 degrees in hull traverse rate. Its specific power will grow, and gun dispersion on the move and while turning will decrease. 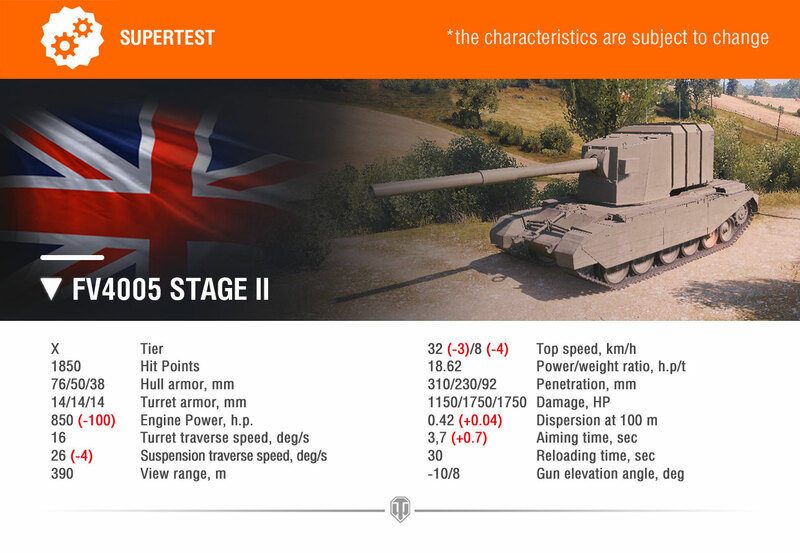 The stats of the British queen of alpha strikes, the FV 4005, are about to change too. Most of the tweaks deal with the chassis. The top forward speed will decrease (from 35 km/h to 32 km/h), and the top reverse will drop from 12 km/h to 8 km/h. The same will happen to the engine power (down to 850 hp from 950 hp) and the hull traverse rate will reduce to 26 degrees from 30 degrees. The gun itself will have less accuracy (with dispersion upped from 0.38 to 0.42) and will take longer to aim (3.75 seconds vs 3 seconds). As always, these values may be subject to change depending on the test results, remember to stay up to date with the news for any changes. Edited by eekeeboo, 29 March 2019 - 05:57 PM. Finally some balancing! Good changes. It needed nerfs, I think the problem was the gun not the handling and mobility but whatever. HESH on FV4005 II should have like 1500 dmg per shot so it will be in the middle between AP and HE with dmg/pene. Don't understand why you nerf Types' standard damage on the 15 cm gun... You effectively give Types tier 8 O-Ho gun which is useless on tier 10. You will do 100-350 damage to other heavies and 192 mm of penetration on HESH on tier 10 is useless when you use derp gun on a heavy. I agree that Types needed a nerf to their guns and removal of that op special ammo was the right choice but I don't get nerfing gun to tier 8 level. People will start to hunt light tanks with superheavies. 14 cm gun in other hand is useless as special ammo penetration on such a derpy gun is way too low. You do nothing with 293 penetration against real armor and you still have 0.42 dispersion and 2k dpm making aiming at weakspots impossible and people will just yolo you. Type 4/5 changes are a step in the right direction. The nerfed derps are now garbage (KV-2 derp is arguably superior to the nerfed Type 4 derp, as it has similar reload with higher pen and alph, and the O-Ho derp is superior to the derps of both Types as it has both better reload and alpha than even the Type 5). Introducing the derp guns for the Types was a mistake, anyway. The 14cm AP gun buffs and armor changes is what you should have done in the first place back in 9.17.1 when the Types got buffed. Since the full removal of the derp guns seem impossible, I welcome this solution, too. It's probably the closest we get to the removal of the guns, anyway. The AP gun pen buff might seem small but it seriously helps, especially with the gun handling buff. The premium special ammo pen is now enough to go through other Type 5s, Maus and E 100 turrets more reliably, which were the tanks the current AP gun struggles even with the "special" ammo. The mobility buff is unexpected, but I don't mind it, makes the tanks more comfortable to play. If those two changes above were added to the listed supertest changes, then it would be almost perfect. 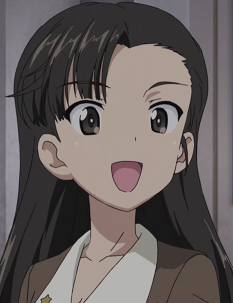 However, the derps becoming far less oppressive and AP gun becoming finally decent is actually a great change. The disgusting premium HE slinging derps doing 600 to hulldown super-heavies was extremely idiotic and the fact it was in the game for 2 years is just wrong. Also I really appreciate the fact that the AP gun Type 5 is finally viable. It took 4 years for the AP gun Type 5 to be decent and 2 years for the derp gun to get fixed, but hey, better late than never, I guess? FV4005 change isn't really going to do much, though. It still oneshot tanks, while the accuracy and gun handling change just makes the gun more frustrating. In fact, it actually encourages the usage of HESH even more because now the AP shells are even more unreliable thanks to worse aimtime and accuracy. Edited by leggasiini, 29 March 2019 - 07:02 PM. The type nerfs... ok, i can live with them still having no weakspot armor if their derps become fairly bad and hopefully bad enough that most will start using the AP guns. excellent step in right direction. Next they just need to get rid completely of P2W element from all ammo (reducing prices to standard level along with damage nerf) and add weakpoints on tanks. Excellent step. Edited by Bucifel, 29 March 2019 - 06:56 PM. Type 4/5 changes are step in the right direction. The nerfed derps are now garbage (KV-2 derp is arguably superior to the nerfed Type 4 derp, as it has similar reload with higher pen and alph, and the O-Ho derp is superior to the derps of both Types as it has both better reload and alpha than even the Type 5). Introducing the derp guns for the Types was a mistake, anyway. The 14cm AP gun buffs and armor changes is what you should have done in the first place back in 9.17.1 when the Types got buffed. Since the full removal of the derp guns seem impossible, I welcome this solution, too. It's probably the closest we get to the removal of the guns, anyway. I can agree with this, the AP gun could use some further buffing to really make it relevant choice. Finally I'll be able to play my Type Heavies with the AP gun again. The AP gun is already better than the derp on type 4... as long as you go full gold Which is what i did when i grinded the tank. 19.5s to do 600 dmg or 15.5s to do 600 dmg, but having to aim a tiny bit more? Edited by Dr_Oolen, 29 March 2019 - 07:20 PM. AP gun is somewhat bearable on the Type 4 and has always been since they buffed it back in 9.15 just because of it's ridiculous alpha. It's the Type 5 really where the AP gun has always been dogsh*t since they introduced the tank; it should finally be decent now (especially with derp being nerfed hard; full gold HE derp outclasses the AP gun more or less completely with also having the benefits of HE mechanics lul). Edited by leggasiini, 29 March 2019 - 07:22 PM. In the end the best thing about these nerfs might not be the decrease of those tanks performance itself, but the general reaction of wot playerbase to any/all nerfs - which is to stop playing the tanks while proclaiming they are now useless for half a year, until they realize the tanks are still ezmode and broken and start playing them again. So at the least we are looking at 6-8 months of almost no FV/type spam. So you've buffed the FV 4005 back in 9.20.1 just to nerf it back again. Yes, blety, let's nerf the Sh*tbarn back as it obviously doesn't have enough handicaps as does is now. Edited by Bad_Mojo_incoming, 29 March 2019 - 09:03 PM. I don't agree with the FV4005 changes. It's already very easy to kill. The nerfs will make it even more easy to kill while taking the fun out of it. The only problem that I see with the FV4005 is the relatively short reload time for such a powerful shell. Why not increase reload by 10 seconds and leave the rest as it is?